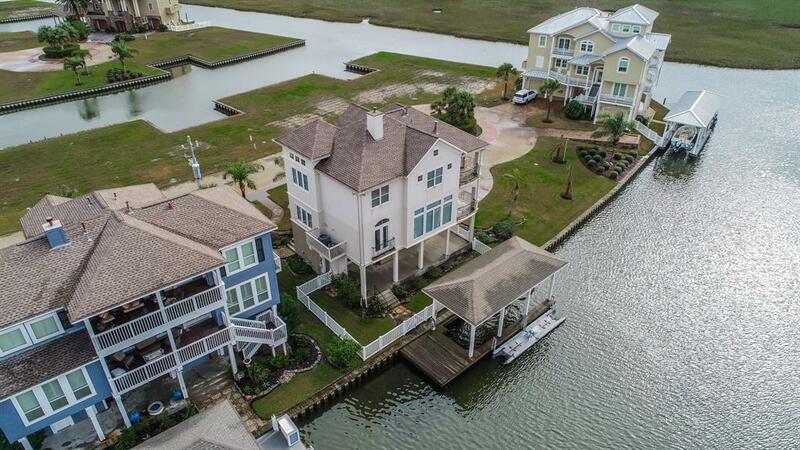 This spectacular waterfront property in the gated community of Harborwalk offers unobstructed views of West Galveston Bay and the Harborwalk south channel. Enjoy coastal living with a covered patio, outdoor kitchen, tropical landscaping, a boat dock and double jet ski floating dock. The 3-story home boasts custom finishes throughout such as high ceilings, elevator, travertine flooring, built-ins, 2 fireplaces, study, and storage room. Hone your culinary skills in the gourmet island kitchen with granite countertops, custom maple cabinetry, wine fridge and top-of-the-line Thermador appliances, including a double oven and 6-burner gas cooktop. The master suite has a private balcony overlooking the water, walk-in closet, dual vanities, two closets, whirlpool tub, and frameless shower. Only 15 minutes from downtown Galveston and 20 minutes to Kemah boardwalk. Direct, private boat access only minutes way to intracoastal waterway, San Luis Pass, Galveston Yacht basin, and the Gulf of Mexico.